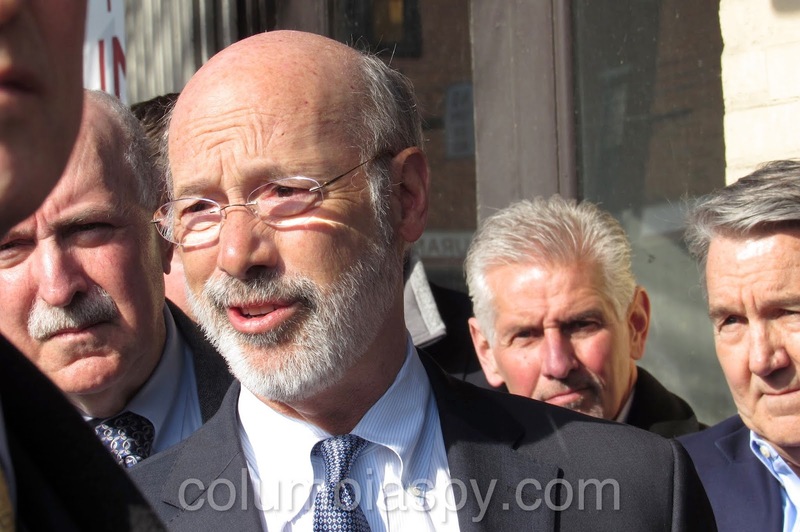 PA Governor Tom Wolf visits Columbia Wednesday morning. 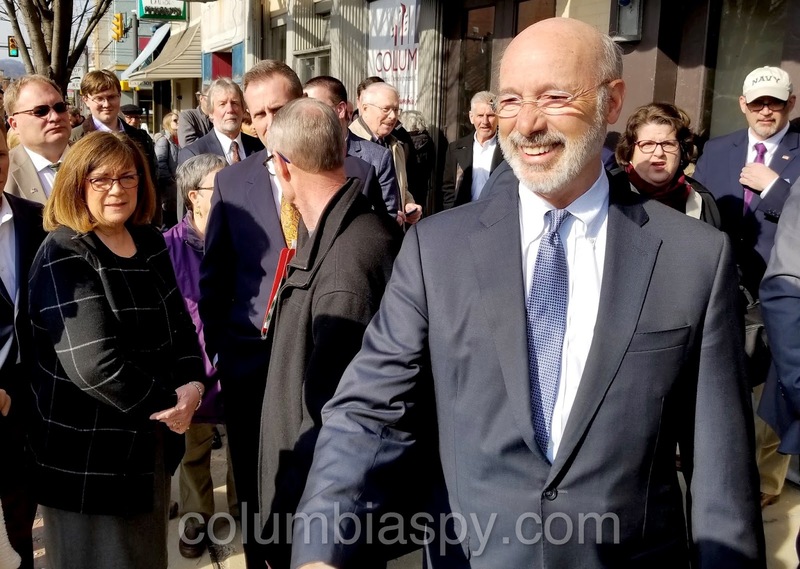 PA Governor Tom Wolf visited Columbia for about an hour and a half Wednesday morning to survey blighted buildings and promote his "Restore Pennsylvania" infrastructure program. 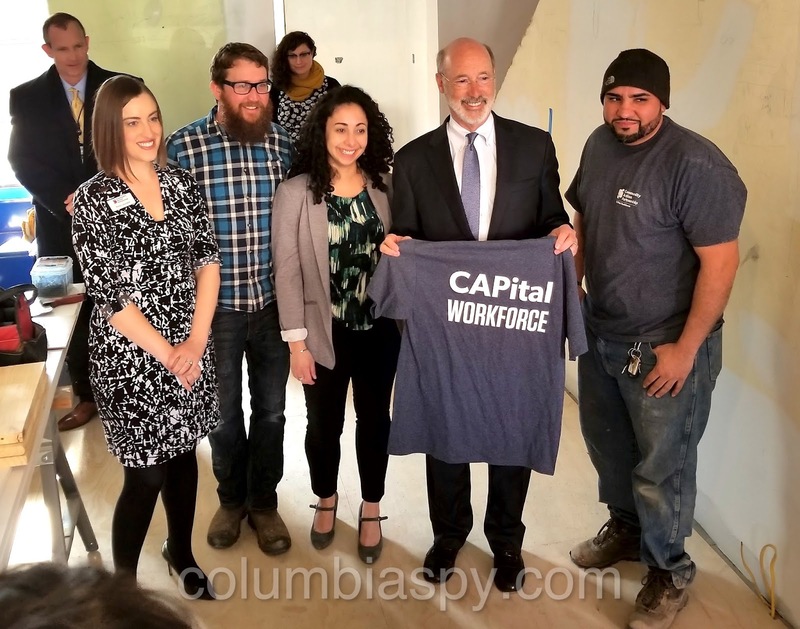 Wolf said he believes there is bipartisan support for the program, which proposes a severance tax to help fund capital projects. The plan includes investing $4.5 billion over the next four years to fund a range of projects, including rehabilitating blighted structures through increased investment in land banks. 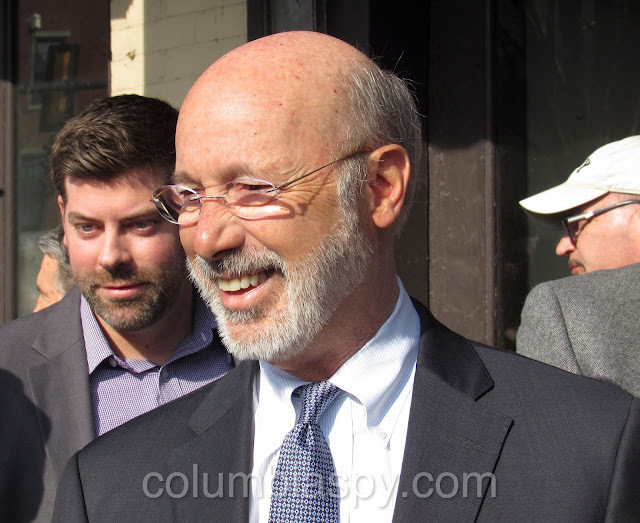 “We Pennsylvanians pay a severance tax,” Wolf said. “We pay it to Texas because they pay a severance tax and they fold that into the cost of their product.” Wolf noted that Pennsylvania is the only gas-producing state in the nation without a severance tax. The first stop on this morning's walking tour was Hotel Locust, which has sat idle for almost a decade. 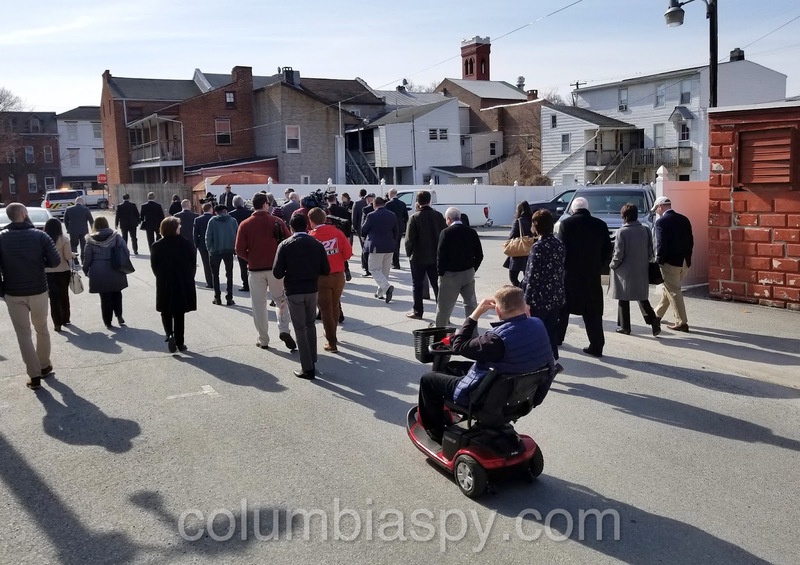 Afterward, a group of several dozen people, including borough council members, school board directors, and other interested citizens, walked to the Columbia Historic Market House, which could be renovated in the near future. Wolf's final stop of the morning was at 304 Cherry Street, where a blighted house is being rehabilitated by the CAPital Workforce, a construction initiative affiliated with the Lancaster Housing Opportunities Partnership, the Lancaster City and County Redevelopment Authorities, and the Borough of Columbia. 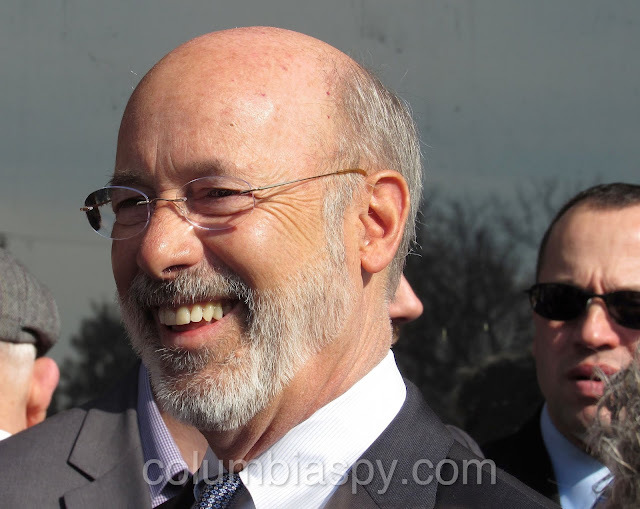 Information on the "Restore Pennsylvania" program can be downloaded HERE. 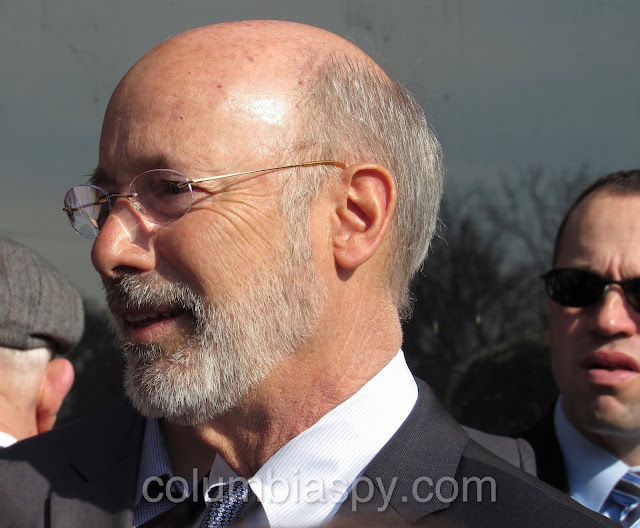 Governor Wolf greets the crowd. 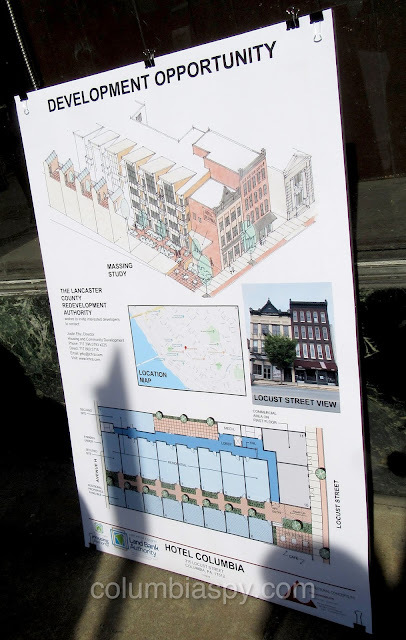 A plan for the redevelopment of the hotel is shown above. After Wolf toured the hotel, the throng eventually made its way to the Columbia Market House. 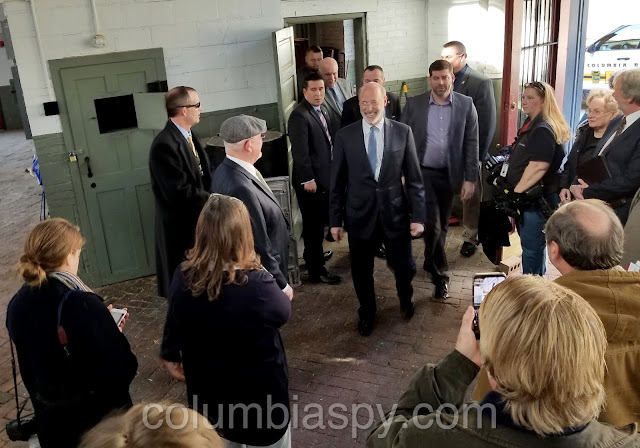 Wolf and others emerge after a quick tour of the Market Houses's dungeon. 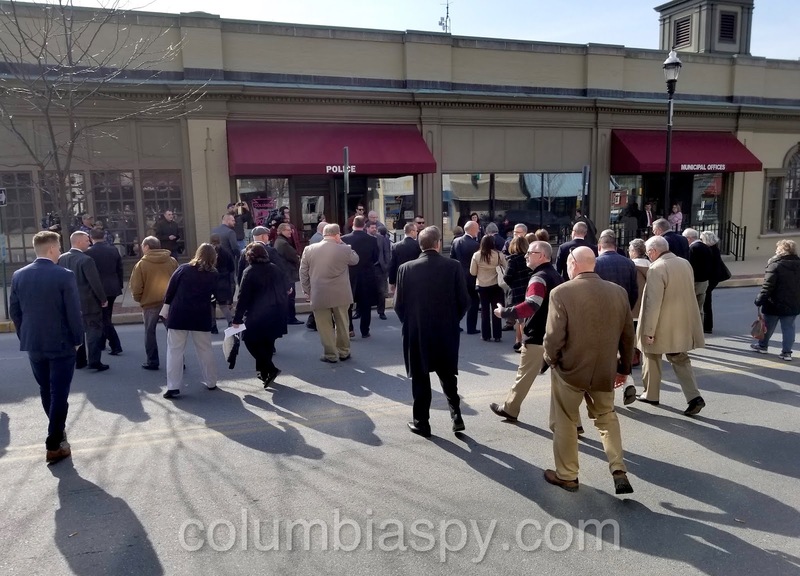 The next stop was 304 Cherry Street, about a block away. 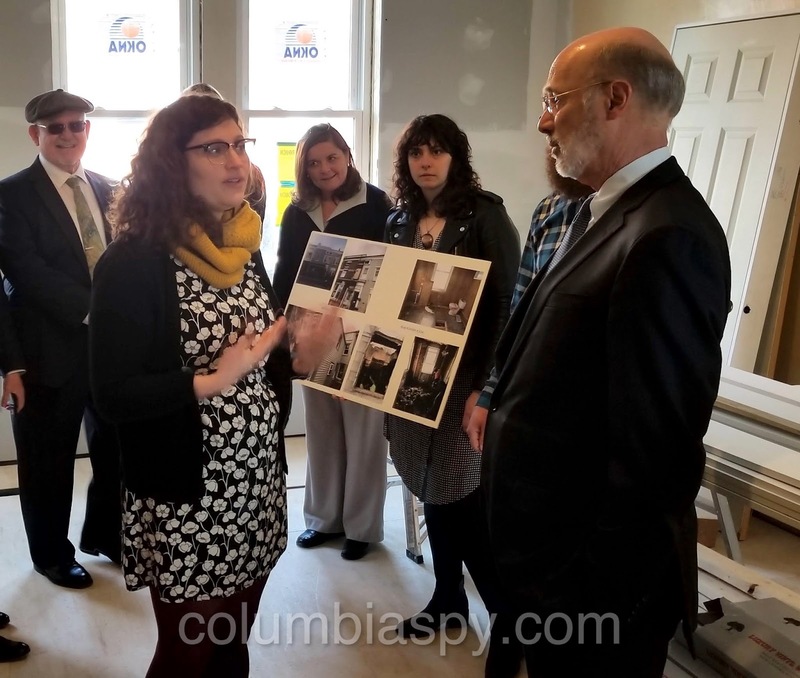 Housing Programs Manager Michaela Allwine of the Lancaster County Housing and Redevelopment Authority explains details of the rehabilitation to Governor Wolf. Members of the press interview Wolf as he exits the house. Never saw so many Republicans greeting a man they despise. Its all just a big game. You have to play. 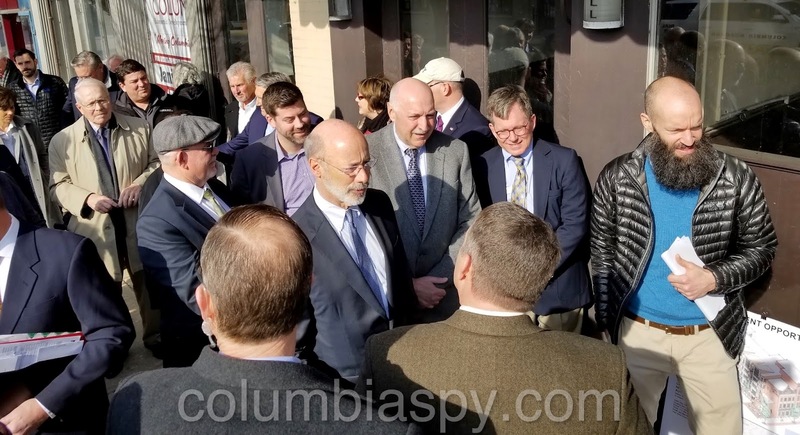 Did Leo take his Scott Wagner yard signs out of his yard for this? Was it the forties look????? 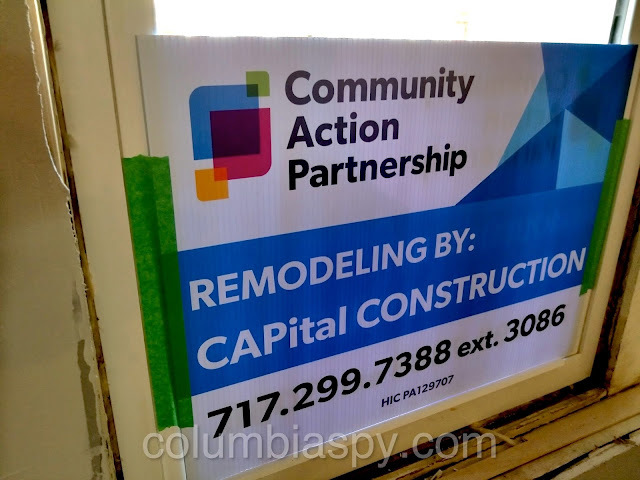 It is so SAD that the people who live in Columbia do not take care of their homes and make those who do CARE their properties are considered TRASH. That mayor and his sidekicks need to step up to the plate and enforce them to clean up their properties and pay their taxes. Those who don't want to enforce the rules then step down and let those who do step in. Let's GO MAYOR TAKE THE BULL BY THE HORN AND GET THE JOB DONE. 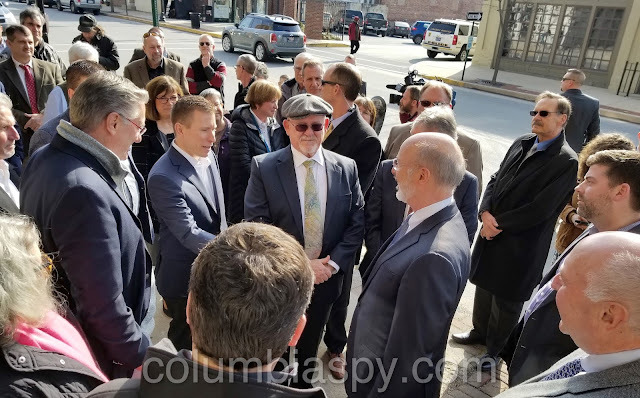 The mayor has blinders on . The smartest one in all the pics is Steve Kaulfold . Yeah! We made the front page of the lancaster paper. Go columbia! He got out of the mess the council has made . Did the loan fund come up ??????? How much did the redelopment plans cost the borough??? Don't be so sure of that Cole. The mayor must have gotten that hat out of moth balls ,maybe it will be councils new attire for there out side looks at the town. 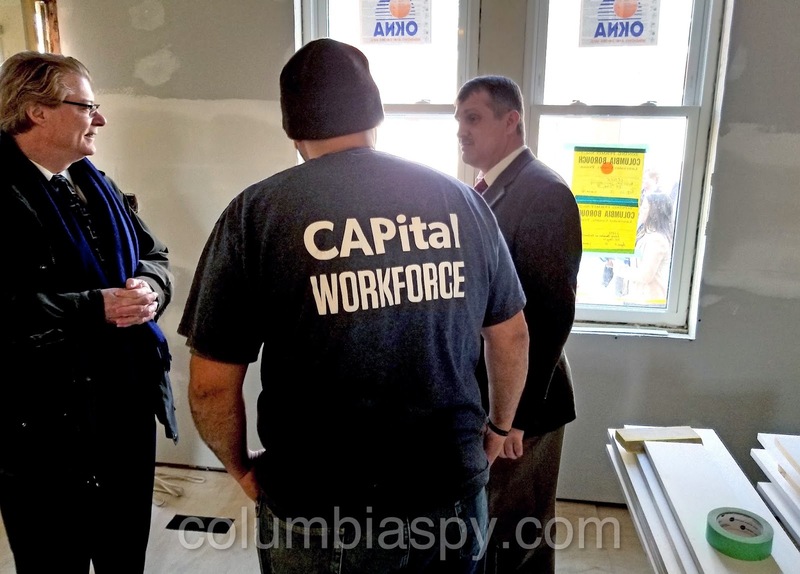 I have one question, why did they not show the money pit to show where Columbia tax money and workers time goes? If half of the time and money would go into the town , it would not be in the shape it is in, tell that to the son of a Columbian.